As a piano player, you dream about owning a Vintage Steinway or Bosendoerfer… but then reality sets in. Not many have the financial means, let alone space, to have these pianos in their living rooms. Fortunately, Native Instruments (NI), well known for their innovative soft synths and samplers, has given us Akoustik Piano: four sampled pro pianos, each with their own character, ready for you to play and record with in your home or studio. If you’re in search of great sounding computer-based pianos for performance or recording, Akoustic Piano won’t disappoint. Besides the great sounding pianos, NI has done some great things with this program such as enabling you to place the pianos in different acoustical spaces, adjust tonal characteristics ranging from the lid opening height to the noise from your pedals, and more. The program is very well thought out. 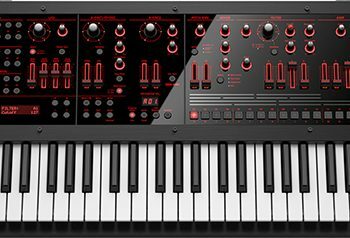 But be forewarned that huge multi-sampled pianos come with the burden of requiring fast computers with lots of memory to run well, and Akoustik Piano is no exception to this rule. However, NI’s just-released Akoustik Piano version 1.1 makes up a great deal of ground that was problematic for version 1.0. While the older version required a significant amount of system optimization on slower systems, we are happy to report that the newer version is much more CPU-friendly. Registered users of Akoustik Piano 1.0 should immediately download this free update from the NI web site. Akoustik Piano features four pianos: Steinway D, Boesendorfer 290 Imperial, Bechstein D 280, and the upright/compact Steingraeber 130, and each piano type has four presets to choose from. 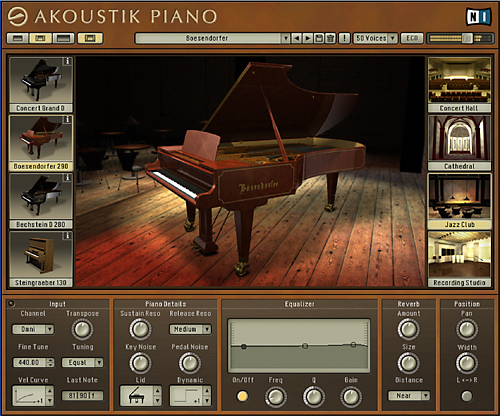 To tailor the acoustics desired, each piano can be placed in one of four different virtual rooms: concert hall, cathedral, jazz club, and recording studio. Each of these rooms has a graphic designating where it is, and a nice touch is that clicking on the graphic will give historical information and sonic qualities of that particular piano. To further tailor the sound, resonance parameters can be altered including pedal and key noises, lid position, velocity curve, and fine tuning (to other than 440 Hz; some pianos are tuned slightly higher to give a brighter sound). You can also adjust reverb, panning, equalization (three-band), and microphone placement (close miking or more distant stereo placement). There is a tuning type selector (which now includes stretched tuning), and there is an una corda setting to further modify the tone, too. 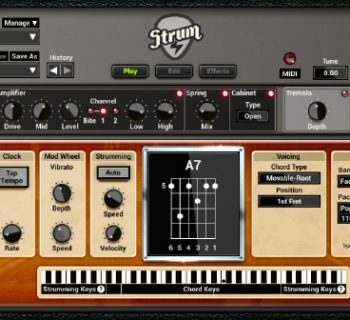 One other feature Akoustik Piano includes is a basic metronome and two-track MIDI recorder. This is useful for capturing ideas quickly when the program is functioning in standalone mode. Since the program includes drivers for ASIO 2.0, DirectSound, MME, and Core Audio, it has tremendous flexibility for use as a plug-in instrument to your favorite software on either a Macintosh or PC. It even works with Apple’s GarageBand. A new (and appreciated!) 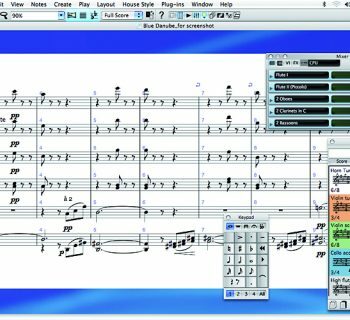 feature is the ability to manipulate MIDI files in standalone mode. To lessen CPU demands, the program allows you to select how many voices you wish to allocate to the piano, ranging from fifteen to 150 (the limit in version 1.0 was fifty voices), and 16-bit piano samples are included in case your computer isn’t powerful enough to handle the 24-bit instruments. We tested Akoustik Piano on both a Power Macintosh G4 dual-processor 1.42 Ghz with 1 GB RAM (well surpassing NI’s minimum requirements of a single 1.2 Ghz G4 processor with 512 MB) as well as on a Power Macintosh dual-core G5 2 Ghz with 1 GB RAM. It is Windows XP compatible as well. Installing and authorizing the software ran smoothly, and the DVDs (there are four) required nearly 16 GB of hard drive space for full installation. Happily, no USB key/dongle was needed. We first ran the program in standalone mode. It was easy to navigate through the different piano presets, and equally as easy to edit the tonal characteristics of each piano. It isn’t mentioned often, but the graphics are pleasing as well. With the 1.0 release of Akoustik Piano, we experienced a variety of performance problems on our G4 system that required substantial adjustments to our Pro Tools environment to resolve. It should be noted that these tests were performed using the 24-bit samples, and we presumably would have fared better using the 16-bit samples. Happily, with the 1.1 release, essentially all of our performance problems disappeared without the need for extensive system optimization (or resorting to the lower-resolution samples). On extremely rare occasions there was a dropped note or passage, typically when the number of voices was set high and the damper pedal was being held (essentially creating more polyphony). There were no issues at all on our dual-core G5, with either version. We had the same easy installation, and there were no problems loading the samples. Akoustik Piano ran flawlessly. No dropped notes, no clicks or pops – just great piano tone. Akoustik Piano really shines in this area. We heard great sounding high notes, rich bass notes, and well articulated mids. Each piano has been very well sampled, and the specific quality of each piano is well represented. Which one you like is a matter of personal taste, and each piano can be edited to suit your needs. All too often piano samples only cover one part of the sonic spectrum well – great highs or great bass, for example. But Akoustik Piano seems to have the entire range well covered. The Concert Grand D and Boesendorfer pianos, in our opinion, had the sounds we liked best, particularly after adjusting the sounds to taste. The Steingreaber had a whimsical charm, and would be great for “honky-tonk” and dinner theater applications. One interesting feature is the “gain” control in the EQ section, which enabled us to slightly overdrive the piano. It didn’t turn our grand piano into a Rhodes or Wurly, but it was an interesting sounding effect nevertheless. Overall, NI did a good job of explaining features and how they work. This was a well-designed, to-the-point manual that will enable anyone to get up and running with the program. Their support staff was also helpful in pointing us in the right direction when we called them with our difficulties, which were largely with version 1.0. However, a troubleshooting section in the manual would have been much appreciated in light of our difficulties. Akoustik Piano ($339 MRSP) typically sells for $300 and is priced comparably with other sampled pianos.